Israeli Prime Minister Benjamin Netanyahu signed agreements to collaborate on cybersecurity, energy, the film industry, and air transportation with Indian Prime Minister Narendra Modi, according to statements by the office of the Israeli prime minister and by the Indian Ministry of External Affairs. The agreements were signed during Mr. Netanyahu six-day visit to India, which commenced Sunday. This is the first visit by an Israeli prime minister to India in 15 years. Mr. Modi visited Israel in July 2017, the first Indian Prime Minister to do so since India's 1947 independence. The Israeli and Indian governments have agreed to increase their collaboration on the research and production of oil and gas, to financially support Indian and Israeli joint ventures in the cinema industry, and to work together to improve air-transportation between the two countries. The two governments also agreed to collaborate in the field of cybersecurity by sharing technological advancements and execute joint training programs. On Monday, Messrs. Netanyahu and Modi launched an Israel-India Industrial research and development fund, called I4F. Designed to promote technological collaboration between the two countries, the fund will invest $40 million over a period of five years and finance up to 50% of the research and development expenses of Israeli and Indian technology projects and startups. 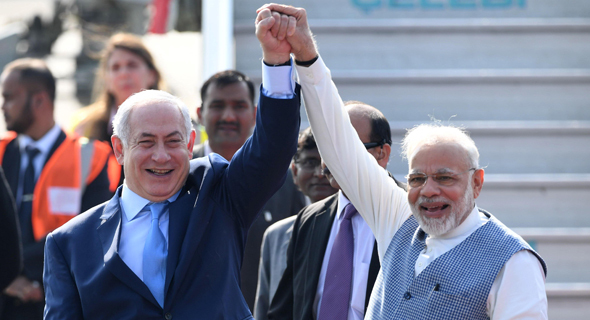 India and Israel formalized relations 25 years ago, but ties between the countries were lukewarm and defense, intelligence, and commercial cooperation remained largely out of the public's eye until recently. In 2016, trade between the two countries totaled $4.17 billion, according to data by the Israeli Ministry of Economy. Earlier this month, the Indian Defense Ministry announced the cancellation of a $500 million deal to purchase anti-tank guided missiles from Israeli state-owned defense contractor Rafael Advanced Defense Systems Ltd. The deal, signed in 2016, had been considered a sign of growing defense cooperation between Israel and India. Indian press first reported on India’s intention to back away from the deal in November.